Symbols*: The young guinea pigs emerge from their cocoon of safety. They have chosen to venture out into the forest to explore the external world that they have yet to fully connect with. A conspicuous pentacle is etched in a stone. It lies adjacent to a leaf-covered by green lichen. The ferns begin to unfurl and reach for the sky. Mist lends to a mystical atmosphere as it slowly starts lifting, revealing the contents of the rich forest. A spiral appears on another rock, an indication that the forest is pulsating with continuous energy. The young animals are tentative as they take their first steps, but soon they will adjust and learn how to retrieve food and other bounties offered by their surroundings. Description*: New opportunities begin to reveal themselves to you. The prospect of improving your life can only be achieved if you take the plunge and make a concerted effort to explore your options. Try to prepare a plan of action as you contemplate your goals and begin your quest to improve your quality of life. Make this a new cycle for expanded opportunities. Try to satisfy your material needs as well as your internal yearnings. Possible Meaning: New opportunities begin to reveal themselves to you. The prospect of improving your life can only be achieved if you take the plunge and make a concerted effort to explore your options. Try to satisfy your material needs as well as your internal yearnings. Thoughts/Points to Ponder: I don’t see this card being as much about material gains but more about connecting with the Earth, with Nature. Being surrounded by nature to hear one’s inner-being, to hear one’s own thoughts clearer, and finding answers. The Guinea Pig brings like-minded people to you with its appearance in your life. No matter how different your beliefs are from the norm, you will find yourself meeting people who think like you do. 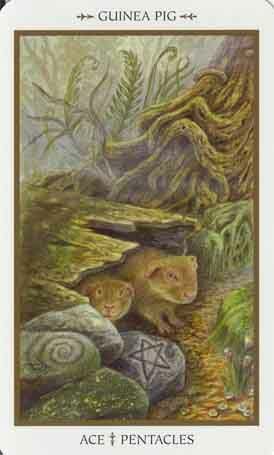 When this animal appears, it signals a time to explore new possibilities, a time to open (or reopen) spiritual doors. It also brings a cautionary message: are you being too solitary in your spiritual practices? Do you need to seek out groups to help with your healing work? Are you ignoring the opportunities presented to you to involve yourself in healing activities? Take advantage of all the opportunities that this special animal brings.